I Missed My Flight… Now What? If you’re a frequent traveler, it’s only a matter of time before you live out one of your worst traveling nightmares: missing your flight. Whether you’ve overslept, missed a connecting flight or just got stuck in traffic, these things happen. You don’t have to panic; the trip is not ruined. After your initial “missed my flight!” freak-out, use our guide for the best steps to surviving your first (and hopefully last) missed flight. Time is of the essence when you realize you’re not going to make your flight. If you missed a connecting flight, the airline will cover all extra fees and baggage claim hassles you may have due to the missed connection, but you must contact the airline as soon as you know you won’t be there on time. The sooner you contact customer service, the higher your chances are that you can be booked on the next flight, saving hours of moping at home or the airport. If you missed your flight through no fault of the airline, you may still be able to get on another flight, but change fees can be costly. To avoid those charges, contact the airport directly at their local number to speak with someone immediately. If you notify them before the gate closes and they can sell your seat, you’ll more than likely avoid extra charges and hopefully, get on the next flight out. Whether you’re at home, in a taxi or at the airport when you realize you’ve missed or will miss your flight, reach out as soon as you can. Unfortunately, as a passenger, you don’t have many rights if you miss your flight. There are only two real options when this happens: you can get on another plane as a stand-by passenger (sometimes for a small change fee), or you’ll have to buy a full-price, one-way ticket. The scenario that plays out will often be at the discretion of your ticketing agent, so be sure to speak to them with patience and respect. Knowing that this person could hold your vacation (and wallet) hostage, we recommend always being as polite as possible. Explain your situation calmly and without bitterness, and try to be convincing so the agent sides with you. If you have a sympathetic representative, you may get lucky and have minimal disruption to your trip and budget. Remember, nobody likes helping unappreciated, uncooperative travelers. If you have a difficult agent, you may want to try your luck mentioning the “Flat Tire Rule” to get your desired outcome. Most airlines have an unspoken “Flat Tire Rule” that you can use to your advantage. 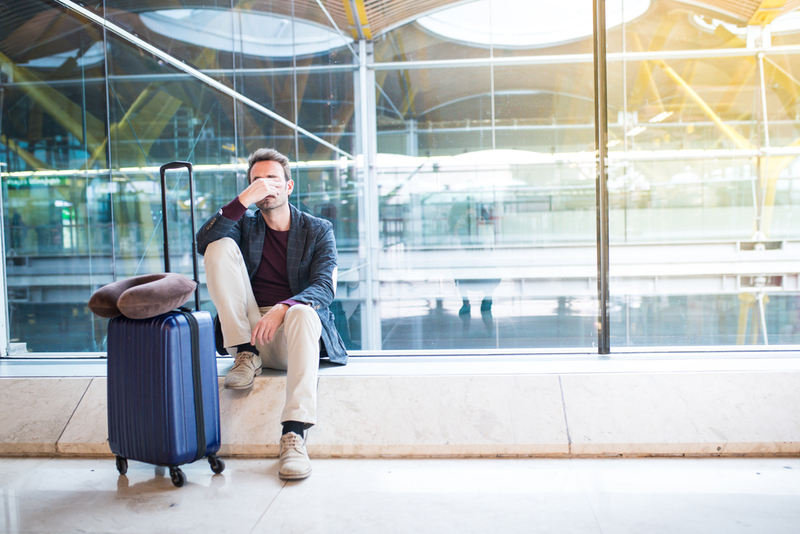 If you arrive within 2-4 hours of your missed flight, and you missed it because of uncontrollable, unforeseeable circumstances, they’ll usually get you on another flight as standby free of charge. Pull out the puppy eyes and woeful flat tire tale. Unfortunately, if the gate agent won’t get you on standby for another flight or the change fees are too exorbitant, you’ll have to purchase a one-way ticket to your destination on another flight. It’s not the most ideal situation, but at least you won’t be stranded at the airport. Try searching through budget airlines to find the best last-minute airline deals or go through a travel agent.